My task is simply to control PC Suite to automate my tasks. 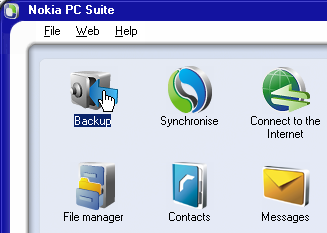 However, this software is not using standard controls which I can use as identifiers to click on the icons shown. 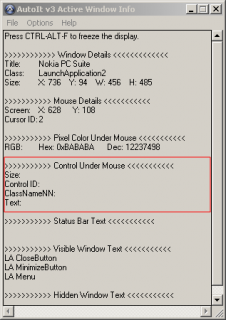 You will find that AutoIt Windows Info doesn't show any information where the mouse is. Please see attached images for details. ich sehe Du kommst aus Deutschland wie ich - also lass uns Deutsch sprechen. Hast Du auch die richtigen Opt-Einstellungen. Schau mal ind er Hilfe unter AutoitSetOption bezüglich der Koordinaten, die können nämlich innerhalb eines Fenster oder allgemeiin den Desktop als Bezugspunkt verwenden. Ansonsten wäre ein kleiner Skriptauszug hilfreich. You gessed it wrong. What made you think I came from Germany?! Thanks very much! It works well, but can't be generic for new versions to come. I'll live with it temporarily. 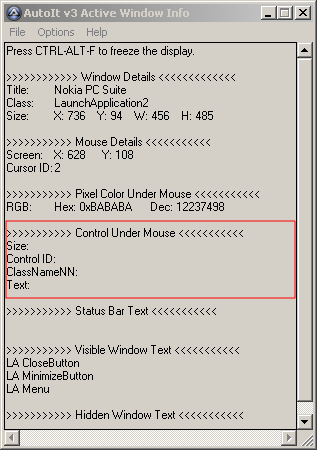 Well, you're going to need to write you a Pixel* function + MouseClick/MouseClickPlus/ClickInControl function in order for it not to be "generic" seeing that it is a "non-standard" control, even then, it will probably look "generic".